Success Academy | Daniel Katz, Ph.D. It is nearing the end of March, which means that my social media feeds and the blogs that I read are full of materials pertaining to the Opt Out movement. Contrary to years of efforts by testing advocates to portray Opt Out as wholly of phenomenon of privileged parents, I know that the efforts I witness represent the work of parents facing bullying and misinformation from administrators trying to keep their test participation levels above 95%. It is also represents the work of brave teachers risking sanction and professional consequences for speaking out against damaging policies that distort curricula and classroom choices. Further, it represents the work of urban education activists who have seen over and over again how annual test data is abused by politicians and policymakers and is used to rank teachers on flawed measures of their performance and to close schools instead of to help and nurture them. The reasons to support opting out are legion. Peter Greene provides an excellent breakdown of eight compelling reasons in this post. Katie Lapham clearly articulates how test refusal is a form of people power that says “no” to a variety of practices that actively harm schools and children. Last year, Bronx Principal Jamaal Bowman made an impassioned case for why he supports parents’ rights to refuse the state exams, asking why if the city’s most elite private schools refuse to give exams like these why do we just accept them as necessary for schools full of children in poverty? New York State Allies for Public Education published this informative response to general misinformation and obfuscation on testing policy put into the state “information toolkit” for administrators. I urge you to read these pieces carefully and thoughtfully and to seek out others on the subject if you are not already deeply informed on the issues regarding testing. From where I sit, there are two fundamental reasons why parents should consider opting their children out of the annual examinations. First, they are a failed policy. Annual, high stakes, standardized examinations were ushered in as part of the No Child Left Behind legislation under President Bush with a promise that with an ongoing set of achievement data that could be compared against annual improvement targets and consequences for not meeting those targets that schools would improve, especially schools that serve student populations who consistently struggled. The promise was enticing enough that a bi-partisan coalition signed up, including civil rights organizations convinced that states and cities would be forced to help schools where most students were of color. We as a nation have devoted enormous amounts of time and money to the focused goal of increasing test scores, and we have almost nothing to show for it. Just as importantly, there is no evidence that any test score increases represent the broader learning increases that were the true goals of the policy – goals such as critical thinking; the creation of lifelong learners; and more students graduating high school ready for college, career, and civic participation. While testing advocates proclaim that testing drives student learning, they resist evidence-based explanations for why, after two decades of test-driven accountability, these reforms have yielded such unimpressive results. Second, test-based accountability is monstrously unjust and racist, subjecting communities to punitive results and “solutions” that aid only a few and which disproportionately take away input into education from parents of color. While No Child Left Behind had already done significant damage to schools and learning, the Obama administration’s policies went much further. Under the Race to the Top competition, states were incentivized to adopt common standards, to join mass testing consortia, and to use the results of test data to promote school choice and to evaluate teachers. These are not benign policies. Value added measures of teacher performance have been and remain highly unreliable ways to evaluate teachers, and while school choice advocates like current Secretary of Education Betsy DeVos and her predecessors in the Obama administration like to portray school choice as empowerment for students and parents, they persistently fail to consider the nature and consequences of those choices. Urban charter schools rarely enroll identical populations of students as their host districts, and high performing charter schools frequently use shockingly high attrition rates to enhance their overall test scores. The idea that urban charter schools offer parents “choices” the way that suburban parents enjoy choices, as so often claimed by their proponents, is laughable – it is hardly a choice to be offered a district schools that is chronically underfunded and neglected by policy makers or a charter school that is well resourced thanks to wealthy donors but which routinely drives away its students. And yet those are the “choices” offered to urban parents of color thanks to testing policies, choices that would cause their white, wealthy peers to oust elected leaders. And yet, despite these reasons which I believe whole-heartedly, my family will not opt out of the tests this year. That admission comes as a bit of a shock and leaves me with deeply conflicted feelings, perhaps even trepidation that I will lose respect among people whose advocacy and bravery I greatly respect. However, I cannot demand that we be an opt out family this year and honor a promise we made to our children. Last year, as testing time approached, we spoke to our oldest child about the upcoming exams and why we did not like them as a school policy. They were poorly written (they still are). They took up far too much time just taking them and consumed way too much teaching time preparing for them (they still do). The state and city would use the test scores to unfairly judge schools and teachers (and they still will). Based on those reasons, we explained to our child that it was possible to refuse to take the exams and that we would be pleased to make certain the school knew not to administer the exam. It did not take much to get a “yes” in response to this argument, and for those who think we may have pressured our child, this is a young person who, at the age of six, deduced atheism without any outside influence. It was important to us that this be a family decision that our child participated in rather than one we insisted upon without listening. Compared to many families who opt out, we were exceedingly lucky. The school knows what I do for a living, and we were subjected to no active campaign to get us to change our mind, even though New York state policy encourages principals to do just that. On the other hand, our school really has no active opt out presence, and to my knowledge, our child was the ONLY student in the school to opt out and spent the better part of two different weeks helping out in a Kindergarten class. Again, better than what happens to many students, but it also made our child stand out. So when testing time approached again this year, we sat down for another conversation, but the result was very different. Without being particularly upset or visibly shaken by the previous year’s experience, our child decided to NOT opt out. Part of keeping my word on our child having the right to have a say in this means that we are not an opt out family this year. Over the weeks, I have managed to tease out my child’s reasons. Some of it is sheer curiosity about what the other kids will be spending so much time doing. Some of it is recalling feeling awkward in a classroom full of Kindergarten kids. Some of it is feeling uneasy being the only student in the grade not taking the test. Some of it is knowing that the test is part of the teachers’ evaluations and concern not taking it will be harmful – I said that the last fear was not what would happen, but the other reasons? I don’t really have an argument there, and I strongly suspect there is no small part of this decision that is based upon not wanting to be the only kid opting out again. I cannot find fault with that. No matter how much I say that this is a “family decision,” at the end of the day, it is my child who has to enact it, for hours and hours at a time, and that would be a very lonely and potentially ostracizing act. Of course, honoring my child’s participation in this decision also means recognizing that we are participating, unnecessarily in my opinion, in a policy that is both a failure and which is used to justify a racist status quo. Just this past week, the New York City Panel on Educational Policy voted to shutter more schools that were supposed to be getting extra assistance and resources as part of a renewal program, assistance and resources that community members in the Bronx say never materialized for JHS 145 Arturo Toscanini. Those same community members present strong arguments that their school was already slated to be taken over by a charter school before the decision on closing was finalized. All of this is made far more possible by the abuse of testing data in decision making, testing data our family will contribute to this year. It is hard to swallow, but perhaps it is also an opportunity for deeper and more incisive self critique. The state tests may help to fuel failed and racist policies, but they are by no means the only examples of injustice in our school system. I prepare college students to become teachers, but am I doing enough to teach them to confront the school to prison pipeline? Am I doing enough to help them drop the pitfalls of “white savior complex” and really learn about their students of color? Am I working to shine a light on how gentrification brings wealth into neighborhoods and opens trendy night spots but rarely does anything for the public schools? What level of my own comfort within the education system that I work for and in which my children are enrolled am I willing to put at risk? How much am I complacent in a much larger system of injustices even if I am able to identify the state tests as especially troubling? Taking time to answer these questions is more important than ever, and my child’s decision about this year’s tests plays no small role in it. At the time, seeking a genuine social scientist to truly study the network gained high praise from representatives of the charter sector in public education such as Nina Rees, president and CEO of the National Alliance for Public Charter Schools, who said the move was unique among charter schools across the nation. The research proposal and reasons for the concern rocked the higher administration at Success Academy to its core, and immediately resulted in a top to bottom self examination of incentives and practices that might negatively impact teaching and learning within the network. Principals were directed to give Dr. Germano full access to faculty and students and to begin a careful process of reviewing how they support teachers in fostering genuine student learning where high test scores are the outcome of an ethical and deeply enriched school environment. The reward and career advancement structure at the network was immediately scrutinized to determine what changes could be made to be absolutely sure that rewards and bonuses do not incentivize questionable practices, and the policy of publicly stack ranking teachers based on student test scores came under question as well. Success Academy CEO and founder Eva Moskowitz recently announced that she is “eagerly awaiting” the results of Dr. Germano’s research and learning what the network can do to continuously improve. Ha, ha – just kidding. She totally banned him from the schools, fired him, and wrote nasty memos about him to the staff. Dr. Germano’s proposed research was submitted to Success in May of 2015. By August, he was dismissed after having been forbidden to visit schools. With such a severe reaction and so quick a dismissal, Mr. Friedman’s assertion that Success Academy “conducted a thorough investigation” is plainly laughable. So much for asking questions. Eva Moskowitz retaliated by lobbing a lengthy complaint against Mr. Merrow at PBS and by publishing a response that included federally protected information identifying the disciplinary record of a former Success Academy student who appeared on camera. This earned her a cease and desist order and a formal complaint filed with the Federal Department of Education. …I wasn’t completely sold on Paul’s approach at first, but when one of our schools was having trouble, I’d dispatch him to help. He’d tell the teachers to give him a class full of all the kids who had the worst behavioral and academic problems. The teachers thought this was nuts but they’d do so, and then a few days later they’d drop by Paul’s classroom and find these students acting so differently that they were nearly unrecognizable. Within weeks, the students would make months’ worth of academic progress. Ms. Moskowitz wanted her readers to infer that all Success Academy has done is simply scale up the teaching methods of one man into a system of nearly 3 dozen schools and roughly 10,000 students. But if that is the case, the public had to wonder just what kind of person Ms. Moskowitz chose to clone across her entire staff when a video of one of the network’s “exemplar teachers” surfaced. In the video, a calm and passive Success Academy student has trouble following her teacher’s instructions and is treated to having her work paper ripped in half in front of her classmates, being sent to the “calm down chair,” and berate in angry tones. The video was not an accident: the assistant teacher was specifically keeping her cell phone ready in order to catch an example of just that kind of behavior because she had seen it so often. In what is now her typical fashion, Eva Moskowitz lashed out at the press for the story, calling her critics haters and bullies. Incentives matter. And organizational values are completely intertwined with what is measured and rewarded. The is well known in the business world, even though companies from Enron to General Motors do not always learn from it. The lesson from Success Academy is that when a school is entirely obsessed with high standardized test scores and when it is removed from nearly every system of public accountability available, it can get those test scores – but at an extremely high cost to anyone who does not serve that end. Perhaps overt, organized, cheating is not a problem at Success Academy (yet), but the organizational incentives for it exist from the very top all the way down to their youngest students. Dr. Germano tried to warn them, but nobody at Success Academy seems capable of listening. Eva Moskowitz, founder and CEO of the Success Academy charter school network in New York City, is used to getting her way. Since founding her first school in 2006, her network has grown to 34 schools with 11,000 students, and she is on track for 43 schools by next year with a goal of 100 eventually. Her school lotteries were portrayed as the only hope of desperate parents in Waiting for Superman, a 2010 documentary/propaganda piece by David Guggenheim, and email records demonstrate that the administration of Mayor Michael Bloomberg lavished her with preferential treatment. When both the state legislature and the office of Comptroller tried to exert legal authority to audit how Success Academy spends the public money it receives, Moskowitz has gone to court to block them – and won. Her deep pocketed backers can raise millions of dollars on her behalf in a single night, and their donations to New York Governor Andrew Cuomo, along with donations from Moskowitz’s own political action committee, have guaranteed preferential treatment from the Governor’s office. This treatment had tangible results early in the administration of Mayor Bill DeBlasio when Governor Cuomo rode to Moskowitz’s “rescue” after the new administration put a stop to 3 of 17 hastily approved Success Academy co-locations – one of which would have displaced severely disabled students from their school and into district schools far less able to serve them properly. Moskowitz ran to the press, declaring that the new mayor had “declared war” on her and the entire charter sector, and a multi-million dollar ad campaign materialized practically overnight. Moskowitz closed all of her schools to take parents and students to Albany for a rally on the same day that Mayor DeBlasio was in the state capitol rallying for universal pre-Kindergarten, and Governor Cuomo appeared at her side vowing to “save” charter schools. It was later revealed that Governor Cuomo not only attended the Moskowitz rally, but also he essentially helped orchestrate from his office. Later that Spring, Governor Cuomo delivered a budget package that required New York City to either house charter schools in public school buildings or to pay for their private space and that forbids charging such schools rent. Recall that Moskowitz has fought tooth and nail to prevent anyone from knowing how she spends the public funds she collects. There’s something bizarre about the way the charter school story tends to be reported by the New York media….Success, the charter organization that’s been most vilified by Mayor DeBlasio, has a stunning record of academic achievement. It’s a record that puts many traditional public schools to shame. This should come at the top of any story like this one by WNYC….Money matters, yes. But the biggest question is how a school run by Success in Harlem, a school that teaches mostly underprivileged kids, has managed to out-perform every single public school in the state on math exams. Let’s look closely at that. We all might learn something infinitely valuable. In July of this year, billionaire hedge fund manager John Paulson, gave a single $8.5 million gift to the network for creating even more schools. My goodness, but it is good to be Queen. The new school year began in a manner to which we have grown accustomed: Moskowitz’s political allies in the billionaire funded astroturf organization, “Families” for Excellent Schools, running hit ads on Mayor DeBlasio. The ads were racially charged, accusing the mayor of leaving over half a million students in “failing schools” (up from last year’s accusations of 140,000 students suffering that fate), and the ads drew immediate and harsh criticism. Moskowitz used two scheduled half days of classes to provide students, families, and teachers as window dressing for different “Families” for Excellent Schools sponsored rallies, an action that would likely get any public school superintendent swiftly fired. Moskowitz also teased the media early in October with a planned big announcement on the 7th, which turned out to be her stating that she would not seek the mayor’s office in 2017 as many of her supporters had anticipated. Instead, she declared she would continue to focus on education where she compared the work of her network to the development of the iPhone. Things went south rather quickly from there. The piece, which includes lengthy segments of Moskowitz looking uncomfortable while claiming her schools don’t suspend students for many of the very minor infractions that are listed as suspension worthy (Mr. Merrow includes the entire disciplinary code, verbatim, on his personal blog), also included material from a mother and son who were willing to talk on camera about some of the incidents that led to his repeated suspensions from a Success Academy. While those incidents were quite minor, his mother also speaks about her son having outbursts, allowing a reasonable viewer can infer that his full range of behavior was broader than discussed on camera, and the mother says her son was suspended in first grade for losing his temper. The mother and son take up a grand total of one minute and 12 seconds in the over nine minute long story. Although the story says their names, I am not going to do so for reasons that should be evident next. Eva Moskowitz was not happy. In a lengthy and accusatory letter to PBS that she posted to Success Academy’s website (and to which I refuse to link), she demanded an apology from PBS, disputed Mr. Merrow’s factual findings, and was especially incensed about the inclusion of material from the mother and son who were willing to go on camera. She released a series of a email communications where she claimed Mr. Merrow misled her (although to my reading they also seem to indicate that she wanted practical editorial control over the story), and then she did something that any ethical educator should find completely unthinkable: she detailed specific incidents from the young man’s disciplinary record, including verbatim text of email communications from teachers about particular events. PBS Newshour responded with a clarification that acknowledges the story should have allowed Moskowitz an opportunity to respond on camera to the allegations but that also defended the accuracy of Mr. Merrow’s piece overall. The reason that I refuse to link to the Success Academy letter or to name the mother and son in this piece is because of a federal law that should have limited Moskowitz’s response to the Newshour segment. The Federal Education Rights and Privacy Act (FERPA) forbids schools and school officials from releasing education records to anyone without prior approval from a parent or a student (if that student is over 18). While I am not bound by FERPA in this matter, as a matter of ethics, I find it appalling that Moskowitz would respond to the situation by publicly releasing information on a child, now ten years old. While the mother and son did go on camera to discuss some of his disciplinary problems at Success Academy, they did not approve of the release of his full disciplinary record and FERPA is written in such a way that such express permission must be granted. Even if one is inclined to think that Merrow did not play fair in his story, the only fully legal response from Moskowitz, and the only one Mr. Merrow could have aired, would be: “We cannot discuss his whole record without permission, but suffice to say, there was more going on than his mother said.” It is also the only moral response, but Moskowitz has always had a scorched earth approach when it comes to her reputation. Moskowitz was sent a cease and desist letter demanding the letter be taken down from the school web site and disputing a number of facts as portrayed in it. In response, Success Academy put another letter on its website, claiming a “First Amendment” right to respond as they did, saying: “Success Academy had a constitutional right to speak publicly to set the record straight about the reasons that your son received suspensions.” This interpretation is false as FERPA does not prevent them from responding, but it absolutely limits the legal content of that response. As of October 30th, the Federal Department of Education has been sent a formal request to intervene in the case on the grounds of Moskowitz’s violation of FERPA and refusal to remedy the situation. Moskowitz’s bad month was not over, believe it or not. Moskowitz quickly threw together a press conference on October 30th with many of her network’s principals standing behind her and denied that Principal Brown was following Success Academy policy. She affirmed her support for the tough disciplinary practices of her schools but insisted they were about having high standards and denied any intention to use them to drive away undesired students. In an interesting twist, Moskowitz declared that, despite advice from others, she would not fire Principal Brown, asserting “at Success we simply don’t believe in throwing people on the trash heap for the sake of public relations.” (That fate after all, is reserved for Kindergarten children) Principal Brown then took the podium in tears and took full responsibility for the “got to go” list, saying “I was not advised by my organization to put children on the list. I was not advised by my organization to push children out of my school.” Moskowitz, true to form, sent an email to staffers on the 30th where she, again, accused the media of having “conspiracy theories” about Success Academy – because when faced with the slow unraveling of your organizational mythology, the best thing to do is harp about how outsiders are out to get you. …. “They don’t provide the counseling these kids need.” If students are deemed bad “fits” and their parents refuse to move them, the staffer says, the administration “makes it a nightmare” with repeated suspensions and midday summonses. After a 5-year-old was suspended for two days for allegedly running out of the building, the child’s mother says the school began calling her every day “saying he’s doing this, he’s doing that. Maybe they’re just trying to get rid of me and my child, but I’m not going to give them that satisfaction.”At her school alone, the Harlem Success teacher says, at least half a dozen lower-grade children who were eligible for IEPs have been withdrawn this school year. If this account were to reflect a pattern, Moskowitz’s network would be effectively winnowing students before third grade, the year state testing begins. “The easiest and fastest way to improve your test scores,” observes a DoE principal in Brooklyn, “is to get higher-performing students into your school.” And to get the lower-performing students out. But we’re supposed to believe Principal Brown came up with his “got to go” list all on his own. And just to make the month complete: Moskowitz is heading for another legal showdown. This time, it is over her insistence that the city of New York give her money allocated for pre-Kindergarten providers but not require her to sign the city contract that every other provider, including other charter schools, has signed. Success Academy already has 72 pre-K students, and the network would be eligible for $10,000 per student in funding, but city Comptroller Scott Stringer declared that Moskowitz cannot decline the contract that every one of the other 277 approved pre-K providers has already signed. This is true to form for Moskowitz who has won other legal fights to prevent any state or city authority from oversight over how she spends the public money she receives. Given how other charter providers have already signed the same contract, some grudgingly, this fight seems more geared towards maintaining her special status as the charter network entirely above public accountability of any sort than over much else. I suspect that Moskowitz will bounce back from this month. After all, she still has Governor Cuomo in her hip pocket (although he isn’t winning many popularity contests himself). More importantly, she still has her billionaire backed political machine designed to bend public opinion and politicians to her cause, and there is no indication that they are going anywhere. She is still the driving force behind the largest charter network in the city, and her goal of 100 schools is still probably attainable. However, in a very real way, I suspect one thing is changing permanently. Moskowitz is losing total control of her situation. Success Academy is run in a very particular way. It has a dynamic, forceful, and very visible personality at the top of the organization. The policies, tone, and demeanor of the organization flow entirely from that person who exerts an extraordinary level of control of the operation right down to the classroom. There is a very narrow band of acceptable behaviors and attitudes. Teachers who embody those behaviors and attitudes can rise very quickly with some becoming school principals in their mid-20s, and students who do similarly well are rewarded with toys and other goodies. Those who do not thrive are subjected to rigorous and frequent “corrections” that either mold them into proper form or convince them to leave. The network has an arguably paranoid attitude towards “outsiders,” frequently declaring to themselves that figures in the press and public are out to get them because they have cracked the code and are disruptors of the status quo. Those who leave and speak out about the network’s inside information are viciously attacked. But Success Academy has grown far too large to keep the lid on everything now. Moskowitz enrolls 11,000 students in 34 schools. She has around 1000 teachers and staff. With such numbers and given their policies, there will likely be 1000s of former “scholars” and 100s of former teachers in short order, and all of them are not going to be intimidated into silence about what they saw while there. The simple fact is that Moskowitz absolutely cannot keep total control over what people say and know anymore, and it is her own policies of driving away students she does not want and burning out teachers that has put her in this position. So even if she fully recovers from this month, I think it is likely we will see many more months like this. The next couple of years will be interesting. Fresh off their rally with charter school parents and students on October 7th, “Families” For Excellent Schools has announced that they will hold another rally on Wednesday the 21st of October. This rally, which will be held in Manhattan’s Foley Square, will reportedly feature nearly 1,000 charter school teachers predominantly from Eva Moskowitz’s Success Academy network. While some teachers from Achievement First, Uncommon Schools, and KIPP are expected to be present, Ms. Moskowitz’s workforce will be the primary participants, and the network just so happens to have a scheduled half school day so that teachers can show up to the rally for the purpose of pressuring law makers into allowing more charter schools in the city. Chew on that for a moment: a scheduled half day of school. A political rally. The teachers in attendance. I don’t know about you, but when my children’s unionized public school teachers take a half day, it is because they are in professional development workshops and related activities. They certainly are not being taken from their schools to a rally organized by a lobbying group funded specifically to increase their influence with lawmakers in City Hall and in Albany. In fact, try to imagine this scenario: Chancellor Farina organizes a half day of work for all city schools and then coordinates a rally for public schools with the UFT on the same day and 1000s of public school teachers, rather than using the half day for professional development, show up near city hall to provide the optics. If you can pretend for one second that Governor Cuomo would not be demanding that the Assembly and Senate hold hearings and seek potential sanctions against both the union and the Chancellor, I question your grip on reality. It would be one thing for “Families” For Excellent Schools to organize political rallies for parents and supporters of charter schools to attend and to use that platform to advocate for more such schools. That is indisputably their right. It becomes much more questionable when those rallies are organized in such a way that Eva Moskowitz closes her schools during multiple rallies, leaving parents with no place to send their children and essentially forcing them to take a day from work to attend so that they and their children add to event’s optics. That is within their rights, but frankly, it is cheap and coercive. But now the network will use a half day of instruction to provide its teachers to send a political message on education policy. And considering the extraordinarily high pressure work environment at Success Academy that is also verified by job review sites, it is hard to believe that very many of the promised teachers for next week’s rally feel comfortable declining to participate. And it is monstrously unethical: our fully public schools would spark legitimate outrage if they organized a school day around sending their employees to a political rally organized by a lobbyist organization. How can it be tolerable for Eva Moskowitz to use her employees, and students, and parents as window dressing for campaigns to funnel more and more public school funding and public school facilities into her organization that she has repeatedly refused to allow “outsiders” to hold her accountable? What Superintendent of schools has such authority? It is important to remind ourselves that “Families” for Excellent Schools is a 501 (c) (3) “public charity” that is a front for billionaire backed efforts to radically privatize public education and break public sector unions. While tax exempt law forbids them from backing specific political campaigns, they are allowed to lobby and to “educate” the public which they do by funneling money from a variety of sources such as the Walton Family Foundation, the Broad Foundation, and Education Reform Now – another dark money financed organization connected with “Democrats” For Education Reform. “Families” For Excellent Schools suddenly shot up in revenue from June of 2013 when they reported $1,000,777 in revenue to June 2014 when they reported $12,265,162. Of that, an eye watering $9,137,910 was spent on campaign and advocacy activities, and while their 990 Schedule A cites no portion of their contributions from “individuals” giving more than 2% of total contributions — that means anyone could give $278,103 without it showing up in that part of the form. This is supposed to be a grassroots organization representing the families of children in charter schools. And Eva Moskowitz consistently gives them compelling optics at their rallies with children, parents, and, now, teachers – dismissed from school for a “half day” that would get any superintendent in the state fired and possibly prosecuted. Is Eva Moskowitz running a chain of schools or is she running the lobbying arm for her billionaire backers who see the expansion of the charter school sector as a means for profit and as a means to break public sector unions? Public school advocates certainly hold rallies to support public education, but we have to do so on weekends and after school hours for reasons that should similarly prohibit Success Academy and other charter schools from providing school hour props for “Families” For Excellent Schools. Our appallingly lax rules for tax exempt organizations may allow for this, but there is no reason why our charter school authorizing bodies and the legislators who write school law should tolerate this. We need our representatives in Albany to change charter school rules so that orchestrating the participation of students and teachers in obviously political events during what should be school hours is expressly prohibited. And then maybe we should explore whether or not “Families” for Excellent Schools is actually within the allowable exempt purposes in the Internal Revenue Code, or whether it is there to use children, their families, and their teachers to enact policies that enrich its donors. Boy, would that be interesting. When I talked with her, Ravitch indicted the hedge-fund titans and business moguls — including Kenneth Langone, a founder of Home Depot, and the Walton family of Walmart — who put their weight behind promising charter schools, leading their boards and lending political clout. “When they call themselves reformers,” she says, “it’s something I gag on.” What these philanthropists are all about, Ravitch says, is making themselves feel good while using charters as a halfway step in a covert effort to pull the country toward the privatization of education. For charter opponents, liberalism is in jeopardy. And from this perspective, Moskowitz, with her results and her readiness to trumpet them, poses the greatest risk. I spent a lot of time on the phone with the author, Daniel Bergner. When he asked why I was critical of Moskowitz, I said that what she does to get high test scores is not a model for public education or even for other charters. The high scores of her students is due to intensive test prep and attrition. She gets her initial group of students by holding a lottery, which in itself is a selection process because the least functional families don’t apply. She enrolls small proportions of students with disabilities and English language learners as compared to the neighborhood public school. And as time goes by, many students leave. The only Success Academy school that has fully grown to grades 3-8 tested 116 3rd graders but only 32 8th graders. Three other Success Academy schools have grown to 6th grade. One tested 121 3rd graders but only 55 6th graders, another 106 3rd graders but only 68 6th graders, and the last 83 3rd graders but only 54 6th graders. Why the shrinking student body? When students left the school, they were not replaced by other incoming students. When the eighth grade students who scored well on the state test took the admissions test for the specialized high schools like Stuyvesant and Bronx Science, not one of them passed the test. She goes on to note that in addition to the phenomenon of selective attrition, she also discussed high rates of teacher attrition at network schools, but that Mr. Bergner argued with her instead of interviewing her. Dr. Ravitch also notes that Mr. Bergner used different language than she did when discussing the issues with him, and all of her points about selective attrition were either ignored or glossed over with talking points that reflect Success Academy’s standard public statements. That attitude (Moskowitz’s) infuriates many teachers at regular schools. When I spoke with a handful, they used words like “metastasize” and “venal” to describe Success Academy’s proliferation. That Moskowitz’s wealthy board members choose to highly reward her track record — her salary and bonus for the 2012-13 school year totaled $567,500 — only adds to the union’s fury. What is astonishing about that brief mention focused entirely upon a few potential epithets and alleged jealousy of Ms. Moskowitz’s salray is that Mr. Bergner DID speak with teachers who work in co-locations with Success Academy schools. In fact, he spoke at length and clearly decided to disregard their input almost entirely. I am fortunate to know one of those teachers through local teacher advocacy groups, and she agreed to inform me about her discussions with Mr. Bergner and to share what it is like to be a teacher at a school where Ms. Moskowitz has claimed classroom space for her students. Her name is Ms. Mindy Rosier, and she is a teacher at P.S. 811, the Mickey Mantle School, a special needs school within P.S. 149 in District 75. They have been co-located with Success Academy since 2006, and this Spring, she and her colleagues found themselves in the center of the storm when Mayor de Blasio decided to not allow three previously agreed upon co-locations for Success Academy expansions. The resulting highly public battle resulted in a 6 million dollar ad campaign accusing the mayor of throwing Success Academy students out of their schools, all funded by Ms. Moskowitz’s Wall Street supporters, and it culminated in Governor Andrew Cuomo helping coordinate a pro-Moskowitz rally in Albany that resulted in the city of New York being bound by the state budget to provide co-locations or pay rent for all charter schools. Can you explain the school where you work? Who are your students and what is the mission of your school? My school is PS811 at PS149. We are an additional site to the Mickey Mantle School family and we are also a part of District 75. My school site serves over 100 children with autism, learning disabilities, emotional and psychiatric disorders in a low income area in Harlem. Harlem Gems also have some rooms in our building. We all get along really well, with the exception of Success Academy. How did the co-location with Success Academy happen? Were there discussions with parents and faculty/staff? Do you know how it was decided to co-locate at your school? Our site opened the same time as Success Academy began. It is my understanding that at that time, space for all was agreed upon. They had a certain amount of classes on one floor in one side of the building. I was hired at that school during the same time, so I am unaware of any other previous discussions with faculty/staff and parents. I don’t think anyone had a problem with that co-location then, but then again we had no idea what was to come. How did the co-location process work? Did you have any input into how the building would be divided between your school and Success Academy? At first, everything was fine. Then, over the next several years, they have requested more and more space from us. Up until last year, I did not know what the process was. I know our teachers did not have a say in this, and I really don’t know what the involvement of my admins were. I do know that just for one year, our former Chapter Leader (who now works for the UFT division for District 75 schools) was able to prevent more expansion on her part. Overall, we lost two floors that included classrooms, our library, our music room, our art room, our science room, and as a matter of making up one classroom, we lost our technology room as well. P.S.149 was so nice and offered us some available rooms at that time. Since, Success Academy has also expanded on their side and they lost an entire floor. So by last year, we had NO free space and P.S.149 was and is crunched for space as well. Do the schools ever share any parts of the facilities? If yes, how does that work out most of the time? If not, do you know why? We are NOT allowed on their floors. However, they always go through our hallways. Because of overcrowding and for safety reasons, they were told not to walk through a certain hallway during our dismissal times. My understanding was that they were not too happy about it and I have observed this still happening a couple of times over the years. All schools share the auditorium. In order to reserve time, coordination needs to be done. When Success Academy is using the auditorium, it is usually closed off to all others. Since our building is of a decent size, many of us cut through the back of the auditorium to the other exit to get to the P.S 149 side. (We have 3 classes on their second floor as well as a speech room and a resolution room.) So many times, when SA puts on a show or an event, it is very loud! There are two sets of doors that lead to the auditorium from our hallway. We have several rooms including classrooms close by. They have no problem keeping those doors open, disturbing our classrooms and other rooms. My office happens to be near there as well. So many times I have gotten up to close those two sets of doors. Sometimes I got looks doing so, but I didn’t care. We were all being disturbed. Noise levels do not have to be that loud. Even with the two doors shut, you still can here them. We just make do, like every other time. We do share the lunch room. In the mornings, SA has their breakfast first and then we do. There is another lunchroom on the P.S.149 side and also because of scheduling, their lunch begins around 10:40. On our side it is 11:30. Whether or not lunch staff starts on time, we have to be out of there just shy of 12. Our standardized students then have recess for a half hour, and then our alternative students have the next half hour. On Wednesdays, Success Academy has early dismissal. They are supposed to come out at 12:30. They exit through our playground. For the most part, they are already lined up to leave as we are heading back in from recess. There have been some occasions where at least one of their classes had come out really early. It was about 12:15 and my assigned class were in the middle of a kickball game. I yelled out several times to that teacher to please hold off, it is still our time. I know I was loud (that’s the Brooklyn in me) so I am pretty confident she heard me but chose to ignore me. My students LOVE recess and when they saw they had to end the game early they got upset very quickly and behaviors escalated. Me and one other para(professional) were trying our best to calm them down. There was another para who had gone inside earlier with another student because of a separate issue. When I saw that para come out, I yelled to him to get help which he did. This was a 4th grade class of about 12 who are all emotionally disturbed and learning disabled. It was such a difficult situation. Some students had to be separated because their anger looked like it was going to lead to some fights. My lunch was next period, and I immediately informed my Assistant Principal. In front of me, she called their principal. I also had to write up several incident reports. Now back to our lunchroom….our lunchroom is also our gym. Right after breakfast, it is cleaned up and the tables are folded and pushed to the sides. We have access to this space all mornings. Now the afternoon is a different story. SA uses the the lunchroom in the afternoons. If P.S.149’s gym is available, they have been nice enough to let us share it. Otherwise adapted phys ed is done in the classrooms. Our gym teacher is wonderful and he has been great adapting to this situation. However, these are kids, kids with special needs, and they need to run a bit. What changes have you seen in your work and your students’ educations since co-locating with Success Academy? What do you think accounts for that? Could you explain any changes to the environment/culture/feeling of the building during that time? What do you think accounts for that? There is definitely and us vs. them feeling in the air. I’ve been told that they have shiny clean floors, new doors, fancy bathrooms, etc. Meanwhile, we have teachers who have bought mops and even a vacuum cleaner to clean their rooms for they feel what is done is not efficient enough. Near our entrance, we have an adult bathroom. It is for staff and our parents. Success Academy parents as well have used it. For many months that bathroom went out of order. Honestly, I am not even sure it is fixed yet, but after all this time, I really hope so. So we would have to either use the closet of a bathroom in the staff lunch area or use one of the kids’ bathroom when it is not in use. You and I know that had that been an SA bathroom, it would have been fixed by the next day. SA also throws out tons of new or practically new materials often. At first, some of their teachers would sneak us some materials thinking we could benefit from it. They stopped out of fear. With all the great stuff that they have thrown out, they got angry when they found out that teachers from P.S.149 and I believe some of our teachers too would go through the piles and take what we could use. Well, now they only throw out their garbage shortly before pick up so that no one could get at it. Nice, right? We have all seen them get Fresh Direct deliveries. Our kids too. Our students have a general feeling that SA students are special based on how they walk around and how they are personally treated either by looks or sometimes comments. Our students may be special needs, but they understand to a point that feeling of us vs. them. We do not at all refer to things that way at all. It truly is sad. We are a school with teachers, other staff, and students. We are all supposed to be here for a reason. It is beyond me that this has been such a battle. This past year teachers and other faculty were very angry. Once I heard about SA’s plan to take over last September, that’s when I started to get involved. Enough was enough. In October, I attended a hearing in my school building, I went to that Panel for Education Policy (PEP) in Brooklyn a week later, and subsequent to that, I have been a part of rallies and press conferences, etc. as I have detailed in my email. All of what happened at my school has led to my educational activism. I have read so much over the years. The more and more I read, the angrier I got. The Alliance For Quality Education has done so much for our school in order to save it and for that I am very thankfully to them and I still maintain a very good relationship with them. I was introduced to MORE (Movement of Rank and File Educators) in late April, and I now sit on its Steering Committee, committed to do right by our teachers and students. Instead of just being angry as I have been for so long, I finally did something about it by being proactive. I do have to say, since my activism began, I have made tons of new like-minded friend and I am grateful of that too. Why do you think Eva Moskowitz and Mayor Bloomberg agreed to further expansion of Success Academy in your building? What would you say to them about that if you could? Oh, boy! I believe they are friends and that they run in same circles. They did not care, never did. When we went to that PEP in October, about putting through those charter locations, it was like nothing I have ever seen before. It was my first one. The room was packed with teachers from so many different schools. There were parents, students, and various community leaders including Letitia James and Noah Gotbaum. People were ANGRY. So many plead their case for two minutes at the mic, some with heart wrenching stories, and all the while the panel was very busy playing on their phones, looking bored and disinterested. It was disgusting. You could hear so many people yelling, “Get off your phones!” I did not speak at this PEP ,but a dear coworker did. I hadn’t found my voice just yet at that time. She tried to give an impassioned speech and when they did not even look at her, she called them out on it and was STILL ignored. It sure seemed to us that the fix was in. Money and power talks and all else suffers. How could you be so heartless? How can you say you are for all children when you have thought nothing about our community’s most vulnerable children, just willing to toss them aside like trash? A population that you refuse to educate and have sent as cast-offs our way? Knowing our building did NOT have any free space, why did you purposely choose to expand here? Why were parents lied to? Why did you perpetuate lies in the media and to the general public? These are just some of the questions I would ask her (Eva Moskowitz) based solely on what she tried to do to my school. Trust me, there are so many more that we all have been asking her for a long time. On the Families 4 Excellent Schools’ page on Facebook, I have gone back and forth with many, and most of those were parents. They had no clue as to what the truth was. So instead of them doing their homework, it was easier to call me a liar, a racist, clueless myself, etc., etc. I didn’t go on there to bash Success Academy. I went on there to inform them of the truth that was completely hidden to them and the general public. After a while, I just had to stop. It was like beating my head against the wall. Moskowitz seems to be this cult-like figure to parents and they adore her. I have even heard her be called a savior! What do you think about the presentation of your concerns in the New York Times article that ran in the September 7th magazine? Is there anything you think the reporter ought to explain to you and your fellow teachers? I was beyond angry. I have no problem taking time out to talk about concerns I have, and on those things that I am passionate. I spent a considerable amount giving very specific facts, and they were all ignored. Other teachers were ignored. Parents were ignored. We all gave verifiable facts, but that did not matter. I personally feel that a good reporter should report both sides of the story. Way too many reporters and various mass media outlets have failed us, our school. our students, their parents, and the general public. I want to know why he blatantly ignored all of us and deceived the general public? Important information that I feel everyone should know, instead of blindly praising a woman with obvious deceitful tendencies simply because they have higher scores. There is a reason for that and the public needs to know the actual truth. Isn’t writing about and printing the truth Reporting 101? We ALL deserve a public apology with answers to the questions I have mentioned. Ms. Rosier has also written to the New York Times and Daniel Bergner to express her surprise that none of her conversation made it into the article, and to remind Mr. Bergner what she had said to him. As of today, the letter has not appeared in the Times, but Ms. Rosier provides the text of it here. 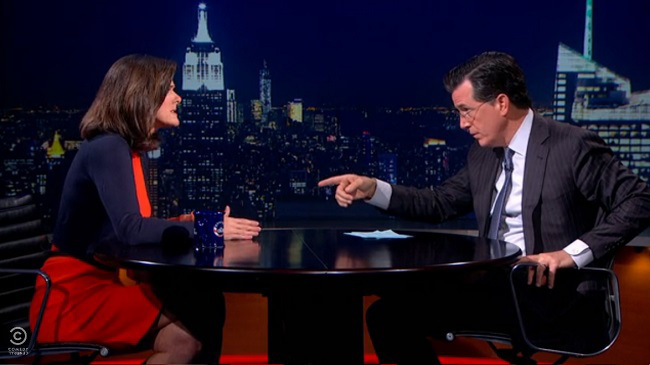 As a former broadcast personality, Campbell Brown has some advantages when appearing on the media to discuss her campaign to end teachers’ workplace protections. She has experience in interview techniques. She understands what works well on camera and what does not. She knows how to pitch her voice and use facial and body language to convey deep sincerity and earnestness regardless of what she really believes. These served her well on Mr. Colbert’s program last week. Mr. Colbert is similarly skilled, but he plays a satirical representation of a right wing ideologue in order to lampoon a segment of the media and to keep his guests off balance. I would argue that he did not level the full weight of his satirical talents upon Ms. Brown, but rather he waited until the end of the interview to present her with some serious challenges that she could not respond to adequately. More on that later. SC: Okay, how’s the crisis in New York? What’s the problem here? 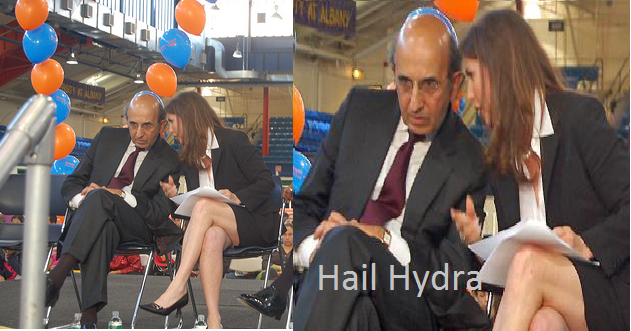 CB: So, if you look at, if you look at the, um, outcomes, student outcomes in New York, okay? So, 91 percent of teachers are around the state of New York are rated either “effective” or “highly effective,” and yet [SC: Sounds good.] 31 percent, [SC: Yep.] 31 percent of our kids are reading, writing, and doing math at grade level. How does that compute? I mean, how can you argue the status quo is okay with numbers like that?? State Education Commissioner John King said he expected some push-back. At a Times Unioneditorial board meeting on Tuesday, he said the number of students considered proficient will likely drop by 30 points. He said, while that number is intimidating, it provides a more honest assessment of what New York’s students know. He acknowledged that makes for nervous educators, but said the state can’t afford to roll back the tougher new standards students will be expected to meet because just 35 percent of New York’s high school freshmen leave ready for college or a career four years later. When the cut scores were set, the overall proficiency rate was 31 percent–close to the commissioner’s prediction. The proportion of test takers who score 1630 on the SAT is 32 percent. Coincidence? Bet your sleeveless pineapple it’s not. Heck, the way I see it, the kids did not even need to show up for the test. So is it honest for Ms. Brown to keep repeating that only 31% of NY students are at “grade level”? Absolutely not — first, because this is not a “grade level” measure and second, because the result was gamed from the beginning. This also brings up another question. If the goal of the “proficient” rating on the exams is “college and career ready” is a 31% proficiency rating actually wrong? In 2013, 33.6% of the U.S. population aged 25-29 had a bachelors degree, which is up over 11 points from 22.5% in 1980 when the education “crisis” rhetoric began in earnest. More of our young population is in possession of college degree today than ever before in our history, and the economic data does not suggest we are in a crisis of too few people with such degrees in the economy. 48% of recent college graduates are underemployed, and in 2010, over 5 million college graduates were employed in jobs requiring only a high school diploma. Moreover, according to Pew Social Trends, today’s wage benefit for obtaining a college degree comes less from rising wages for college graduates than from cratering wages for those without college. One could argue that more students need to be on path to be “college and career ready” by their third grade exams because college is increasingly necessary to keep from falling behind economically moreso than it is necessary to get ahead. Something tells me that today’s reform advocates don’t want to emphasize that point. We would do better to question if the distribution of students who qualify for and are successful at college are concentrated in specific communities and neighborhoods, but discussed honestly, that would require examining America’s rising Residential Income Segregation Index, another topic education reform advocates don’t like to discuss. CB: But, but you, you’re suggesting that mon, that it’s all about the money, and I think it’s not about the money. Mr. Colbert did not let Ms. Brown duck the question of money and school funding entirely, but she quickly professed how she wants to “pay teachers more” AND treat them like “professionals” through evaluations. Then she sidestepped to her “safe” territory by claiming it is almost impossible to fire a teacher with tenure. As previously noted, Dr. Dunn of Michigan State makes it clear that these claims are completely problematic because first, new evaluations using student test scores focus on formulations of teachers’ impact that only accounts for 1-14% of variability between student performance and second, Ms. Brown’s information on the length of time needed to remove a tenured teacher is badly out of date and her assessment of that time is possibly off by more than a factor of four. This all tied to her previous claims the “least effective” teachers are concentrated in schools with high levels of disadvantaged students, but her argument against tenure is not remotely related to that because measuring effectiveness via test scores automatically makes urban teachers less effective regardless of their experience and skill. Additionally, these school have far fewer tenured teachers because the turnover rate in many urban districts tops 50% in three years, resulting in a dearth of teachers with the skills that come from experience. If tenure were truly the problem with teacher quality, then wealthy suburban districts with more stable and experienced teacher corps would not be the districts with high test scores and large percentages of college bound graduates. In this sense, Ms. Brown’s fight against tenure resembles Republican led drives for voter ID laws that threaten to block 100s of 1000s of currently eligible voters in order to stop a “problem,’ voter impersonation, that occurs so rarely it does not statistically exist. Mr. Colbert then pivoted to what appears to have been his most important question of the interview — what is the money involved in Ms. Brown’s lawsuit? SC: Just trying to win, Campbell. Just trying to win, all right? Um, your organization, where does it’s money come from? That’s one of the things they asked me to ask you. Ms. Brown’s point here appears to be that despite her fronting the organization that is facilitating the lawsuit, the efforts on behalf of that suit are, in essence, charitable. This may be true as far as legal fees are concerned, but it is absurd on the face to even hint that there is no monetary value to the assistance Ms. Brown is giving the plaintiffs her organization recruited. First, her connections and celebrity almost certainly played a role in obtaining the legal services. 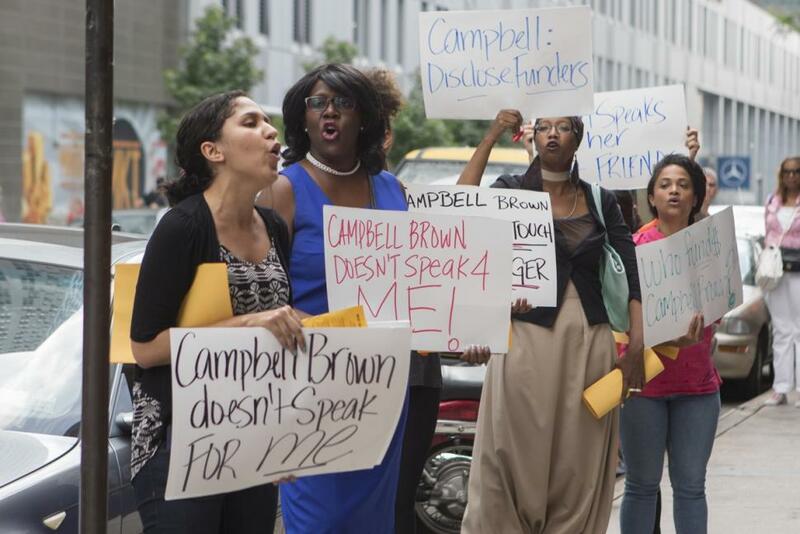 Second, Ms. Brown is a media ready spokesperson who has been giving interviews and penning opinion articles on behalf of this cause, and such services would cost dearly if they came from a private consulting firm. Further, Ms. Brown has managed to sign up the services of Incite Agency, led by former Obama administration alumni Robert Gibbs and Ben LaBolt to do publicity for the cause on a national level. The plaintiffs in this case are enjoying pro bono legal services, Ms. Brown’s celebrity and public relations services from former White House personnel. I think it is sufficient to say that those are no small levels of support. Ms. Brown is married to Dan Senor, who was the former spokesman for the Coalition Provisional Authority in Iraq following the fall of the Hussein Regime. He sits on the board of of Michelle Rhee’s StudentsFirstNY, and he joined hedge fund Elliot Management before becoming a top adviser to Presidential candidate Mitt Romney. Ms. Brown is on the Board of Directors of Eva Moskowitz’s Success Academy chain of charter schools, an organization that boasts massive financial support from Wall Street. Her ties to people who have been pouring money into education “reform” in the interest of charter schools is not difficult to establish, as blogger Mother Crusader has demonstrated. Suffice to say that these are incredibly wealthy and politically connected people who are the most likely donors to her organization. And Ms. Brown wants us to believe that they need to be “protected”. That if people want to know who is funding lawsuits to challenge laws that were passed by democratically elected governments and job protections that were subject to open and adversarial negotiations between unions and administrators, they cannot know because the donors seeking to overturn such laws could not abide potential criticism of themselves in the public sphere. I am sure that Eva Moskowitz’s donors are just quaking in their boots…right after they drop another $400,000 into Governor Cuomo’s pockets. 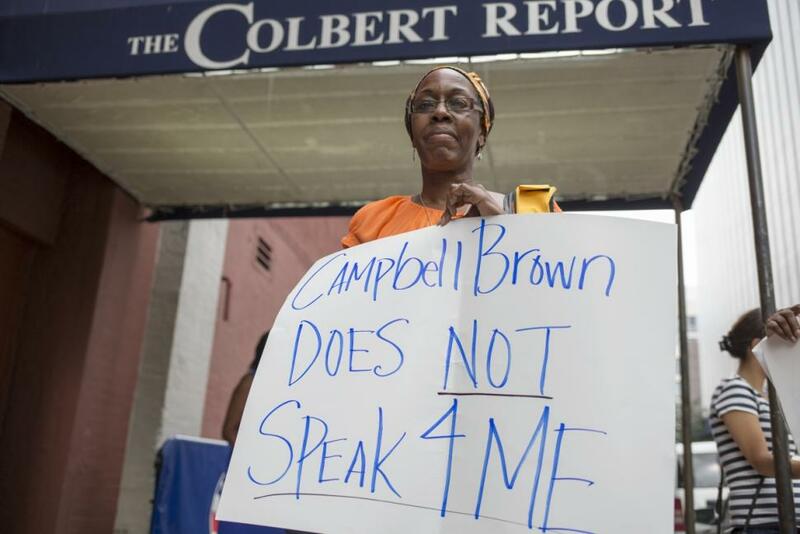 Mr. Colbert did not sneak a camera crew down to the street to make Ms. Brown look as ridiculous as she richly deserved at that moment, but the fact that he led her to make such a ludicrous statement is telling in an of itself. Today, it is very hard to trust that major media outlets will take the time and effort to research and interview people trying to lead public debate via deception, and on issues that require a genuine understanding of complex social phenomena, that is even less likely. I have written before how abysmally the New York Times’ editorial staff have failed in that regard, preferring to take the statements of advocates with wealth and connections at face value. Mr. Colbert is not a journalist, yet he and his fellow comedians Jon Stewart and John Oliver have become almost guardians of truth in recent years. It is often more likely that Mr. Colbert or Mr. Stewart or Mr. Oliver will highlight the absurd inanities, half truths and contradictions routinely offered by politicians, pundits and advocates. In the case of Ms. Brown, Mr. Colbert got her to openly confess to a truth that is gaining greater and greater public awareness: American governance is increasingly oligarchical in nature whereby elected officials craft policy more to serve the interests of their very wealthy donors rather than the interests of the actual voters who put them in office. Ms. Brown’s undisclosed donor list is a perfect example of this, and her refusal to disclose under the fiction that her donors could possibly be intimidated by moms and teachers with home made posters should be mocked loudly and frequently. I am grateful to Mr. Colbert for organizing his interview to that point, but I am saddened that we rely almost exclusively on satirists to get to the heart of public affairs these days. The founding class of Eva Moskowitz’s Success Academy chain of “no excuses” charter schools graduated from eighth grade last week. Of the original class of 73 students who enrolled in 2006, 32 made it to last week, and, according to Juan Gonzalez of the New York Daily News, despite 27 of those students sitting for the entrance exams to New York City’s highly selective public high schools, no Success Academy graduate qualified for admission. Moskowitz has widely touted her schools’ closing of the achievement gap between racial demographics on state issued standardized tests, and while the city’s elite high schools are rightly criticized for their low enrollment of black and Latino children, Gonzalez notes that the overall 12% acceptance rate for black and Latino students taking the test should have given as many as 3 acceptances from Moskowitz’s school. This is not news that should produce any satisfaction even among Ms. Moskowitz’s most fierce critics, nor should any criticism be aimed at the young children involved. Despite my serious reservations about the atmosphere and techniques employed by Ms. Moskowitz’s charter chain, I have no doubt that the young people who have been at Success Academy 1 since 2006 are admirable and hard working young people, and it is my sincerest hope that they have bright futures ahead of them. Nor do I want my criticism of Moskowitz’s methods and self promotion to second guess the parents who have sought out and appreciated her schools’ focus on discipline and raising test scores. However, Ms. Moskowitz has applied to the state for another 14 Success Academies and under the current state budget deal approved in Albany, New York City will have no say in granting these charters and will have to provide space for the schools or pay Moskowitz’s rent in another facility. The sharp decline in the enrollment of her first graduating class and her curriculum’s inability to place graduates in the city’s most selective high schools (despite her claims of closing the achievement gap) requires the asking of some sharp questions. And it is well beyond time that Ms. Moskowitz answer questions of the public that is required by law to pay for her schools. Ms. Moskowitz is not controversial merely for her confrontational manner nor for her refusal to let the state examine how her chain uses the substantial sums it gets from taxpayers. Success Academy is part of the “no excuses” camp of education reform that insists if you fire the right teachers, insist upon extreme personal rigor and focus upon the “basics” that you can close the historic achievement gap between white and Asian students and their black and Latino peers. The school of thought has powerful advocates among the likes of Michelle Rhee and Joel Klein and demonstrably has the ear of Secretary of Education Arne Duncan and the rest of the Obama administration. It has a certain appeal if you do not think about it too hard. These critics decry those who focus on anti-poverty and anti-racism efforts as “excusing” bad teaching and claim that if people just work hard enough, historic gaps in academic progress, and presumably economic progress, would close. In doing so, however, they take up two exceptionally pernicious implied arguments. The first is that the well-demonstrated deprivations of poverty do not matter so long as the school demands enough out of its students. The second is that the existence of children who demonstrate the desired perseverance proves that others are just slacking and could overcome if only they just worked hard enough. Both of these beliefs diminish genuinely complex issues to slogans and side step societal responsibility to address poverty. Moskowitz’s schools take this to extremes. The New York Times reported in 2011, when the Success chain had only 7 schools, how children who do not fit into its very narrow mode find themselves subjected to excessive punishments and ongoing suggestions that they should leave. In less than a month of Kindergarten at Success Academy 3, Matthew Sprowal was subjected to so much pressure and punishment (he has ADD) that he was throwing up most mornings, and his mother received direct communication from Moskowitz herself strongly implying her son should be at another school. This is not an isolated case. In 2010-2011, Success 1 suspended a fifth of its students at least once. Public schools in the same neighborhood suspend 3% of students in a typical year. Further, evidence exists that the schools place special pressures on the parents of disabled students to seek different schools. A parent at Upper West Success taped school officials saying they could not properly accommodate her Kindergarten student’s IEP and offering to find him a public school placement. Charter schools like Success Academy take students from a lottery, and in theory, that lottery ensures that they are not selective like exclusive private schools, but practices like those reported by former Success Academy families demonstrate that the schools do not abide by a spirit of inclusiveness (and may actually violate state and federal law). Moskowitz repeatedly tells the media that she is succeeding with the city’s neediest children, but her schools clearly enroll far fewer children on free and reduced lunch, fewer children with disabilities and fewer children who are second language learners than her neighboring district schools, and the pattern of those students who leave the schools in the early grades is not random. “Custom Test Prep Materials: I think many schools use practice workbooks from publishers like Kaplan, etc. We have people whose job it is to put together custom test prep packets based on state guidance. Much more aligned to common core and closer to the test than the published books I’ve seen. Also, teachers are putting together additional worksheets and practice based on what we see in the classroom. Huge volume of practice materials for every possible need (and we use it all, too). Also many practice tests and quizzes that copy format of the test. “Intensive organization-wide focus on test prep: For the last months and weeks before the test, everyone from Eva on down is completely focused on test prep. Just a few examples…. “We have to give kids 1/2/3/4 scores daily. Kids are broken up into small groups based on the data and get differentiated instruction. If they get a 1, they stay back from recess or after school for extra practice. “We get daily inspirational emails from principals with a countdown, anecdotes about the importance of state tests, and ever-multiplying plans for “getting kids over the finish line” (these get old fast). Excessive test preparation is a concern for all New York City schools, and the teacher evaluation incentives implemented as part of Race to the Top have not helped. The New York legislature passed a law this Spring mandating that test preparation can take up no more than 2% of instructional time in public schools. Charter schools were exempt, which is a relief for Ms. Moskowitz’s schools who would apparently lose months of their planned curricula. In a follow up message, the same teacher forwarded a message to Success Academy teachers from a senior administrator giving his ideas on why they have been “attacked” in the media. The message contrasts their work to the work of “failure factories”, claims to have found the “solution” to urban education, claims that people are jealous of their schools and frames Success Academy, which can raise over 7 million dollars in a one night fundraiser, as victims of teacher unions. Missing in the self congratulatory rhetoric and the extreme test preparation? The children pressured and forced out of the network’s schools for reasons no public school could ever employ. There is no “solution” for urban education that involves losing over half a graduating class of students between first grade and eighth. There is no “solution” for the challenges of educating students with learning disabilities, behavioral disabilities or who are learning English that includes pushing them off on to other schools. Which brings me back to the first graduating class of eighth graders at Success Academy 1. I genuinely wish them well, and I certainly admire the qualities they must possess to thrive in an environment like the one described above. But the children Ms. Moskowitz failed to mention in her address to her first class of “scholars” are the ones she failed to get to that day. Those are the children she refused to accommodate and whose education she washed her hands of. And she should be made to account for every single one of them before New York grants her a single new classroom.